On Monday the weather was horrible and I didn’t have the strength either mentally or physically to drag myself out into it in the morning so I waited until the evening when it was dry but still windy. It was supposed to be 35 steady but it felt too slow and far too hard. The same again was scheduled for Tuesday except this time there was to be 30s fast every 4 minutes. I duly attempted it but I still felt tired and my legs weren’t really behaving themselves so it ended up the same speed as the day before even though this one included fast sections. Wednesday meant The Weakest Link relay. This is one of my favourite races of the year. 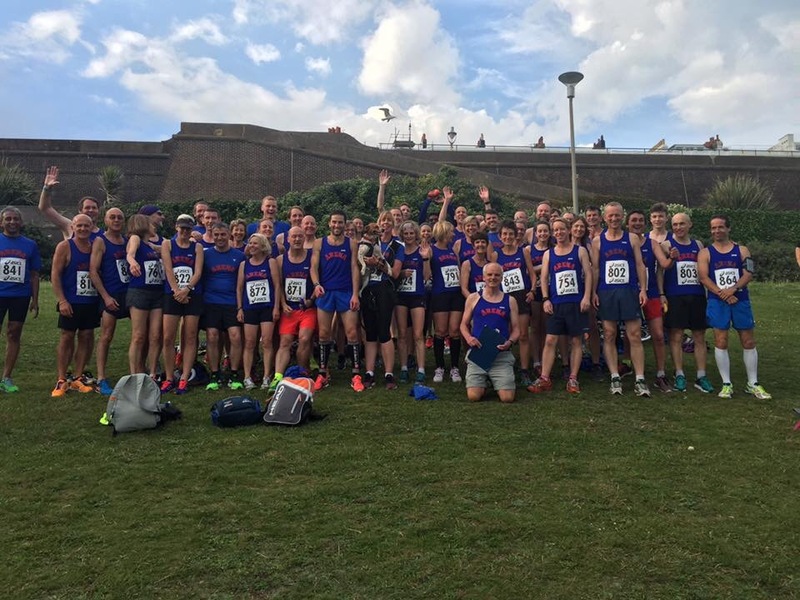 Arena organise the teams so they contain runners of mixed abilities so you have the opportunity to go for it on your individual leg, then running as a team on the last leg. It was a nice sunny day with not a breath of wind. Perfect! 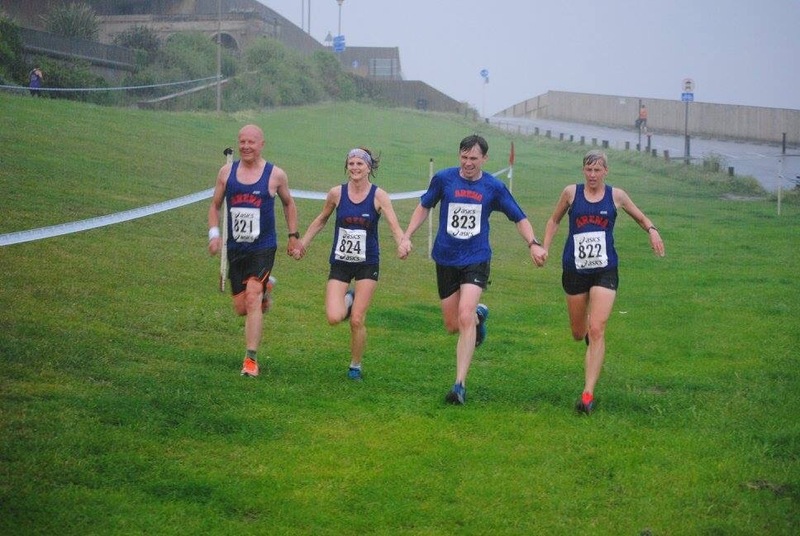 Once again Arena had a loads of takers for this race and we fielded 10.25 teams (poor Richard was the odd one out and had to run with a non-Arena team [the beauty of this race is that everyone WILL get into a team]). I was on second leg so I went to the traditional spectating spot to watch Shawn on the first leg (along with everyone else of course). I was pleased with my run. The first time I’ve really felt like I was running properly. Go iron! Although the course is only 2.6k it is hilly and grassy and gravely in places with only one stretch of around 400 metres which is flat and straight and on road. I practiced my new sensible starting and didn’t go off too much like a maniac. Luckily it’s uphill, on a grassy camber, so easier not to go out too fast. I then just concentrated on running strongly (thank you iron). I was very pleased with my run and had time to recover before it was the time for the team leg. For once the forecast was spot on and an apocalyptic thunder storm arrived at precisely 8pm. This meant the team leg was like running through a fast flowing stream whilst standing under a waterfall (both warm thankfully). Everyone was thoroughly soaked within seconds but there was nothing to do but carry on. The cracks of thunder and inches-away Lightning only added to the fun. As I wasn’t the weakest link the run wasn’t too effortful so I just enjoyed the fear of imminent death by lightning/drowning/eardrum explosion. Finishing as a team, sodden but happy (not that I look it). Thanks to Shawn, Tara and Craig my fellow teammates. Later, once home and dry I discovered I ran my leg at around 6.48 pace which is very pleasing given my current state of iron deficiency. Anyway the whole evening was excellent and great fun and made better by a decent run by me and the attendant happiness that the iron is beginning to kick in. Thursday was a rest day. Surrounded by sodden clothes and shoes. Friday was a steady 25 minutes followed by 4 x 15s strides. It felt like hard work probably because of Wednesday + a day off which of tens leads to stiffening up. Anyway it loosened everything out ready for parkrun. Having not been to the prom for ages (2 weeks) off I made my way there with iron fuelled optimism. It was much windier than forecast but again I just planned to go out sensibly. Rick was there who is running the kind of speed I think I am capable of at the moment so I think I had a subconscious plan to go with him if I should find myself near him. I started a few people back from the start and declined Andy’s beckoning that I should start at the front with him. 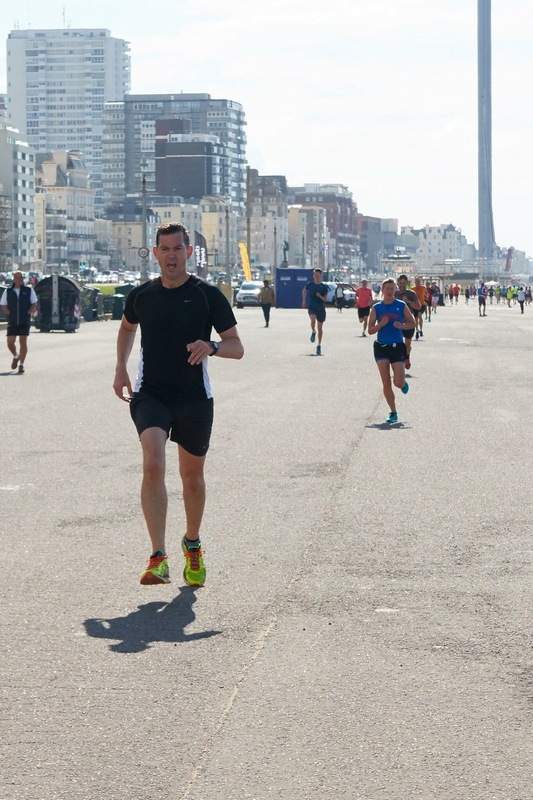 I started steadily and Rick appeared on my shoulder after around 400 metres so I decided to stick with him. So I did. He’s a rubbish windbreak. Once we turned into the final wind-behind long stretch I pulled slightly ahead of him but fully expected him to come past at any time especially once we turned back into the wind for the final time for the last 500 to the finish. However I was able to just about keep ahead. The beauty of iron: the ability to actually be able to move into the wind. 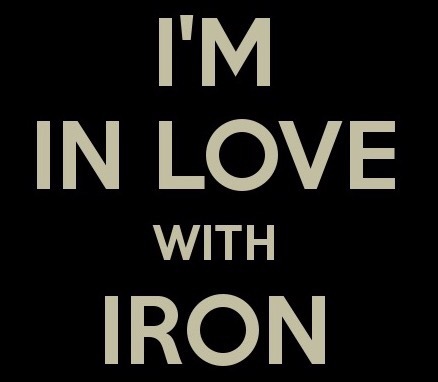 I LOVE IRON. Sorry but it’s difficult to describe what a difference it makes to EVERYTHING. Anyway I managed to pip Rick to the post by 5 seconds. Although my time was “only” 20.50 it felt much easier (though hard) than anything I’ve done for ages (except The Weakest Link which was my first obviously iron assisted good run). It’s hard to explain. It felt hard and horrible in the normal way running does but didn’t have all the weakness and breathlessness and just general inability to get going that anaemia brings. It can only get better from here on in (until I stop taking iron because I’m “fixed” and I ruin it all again – I shall NOT do that this time). An acceptable and promising sign of things to come. After the finish we all got soaked AGAIN (the forecast rain was an hour early). This morning (Sunday) I had a proper breakfast (my failing before last week’s LSR) before setting out on the usual hilly LSR. This week however it had the addition of (3 x) 3, 2, 1 minute fartlek sections. Just a gentle fartlek, picking up the pace slightly, then dropping back to the steady LSR pace. Due to the hilly nature of the route the fartlek sections fell on a combination of up and downhill. I did wait until I was at the top of King George VI before I started though, which was thirty (mainly uphill) minutes in. I’m sorry but I’m going it say it again: Iron iron iron. I felt so much better and stronger and actually enjoyed pushing myself on the faster sections. Even the uphill ones! Ah ha, perhaps this is why some people actually enjoy running? All the hills I’ve been doing have of course made the hills easier and now the iron is beginning to do its work these hilly LSRs are become almost enjoyable. 29 miles for the week but 5 million miles of iron love.